Can you stand the cuteness!?! This is the little truck from the Fresh Eggs Farm Chart! 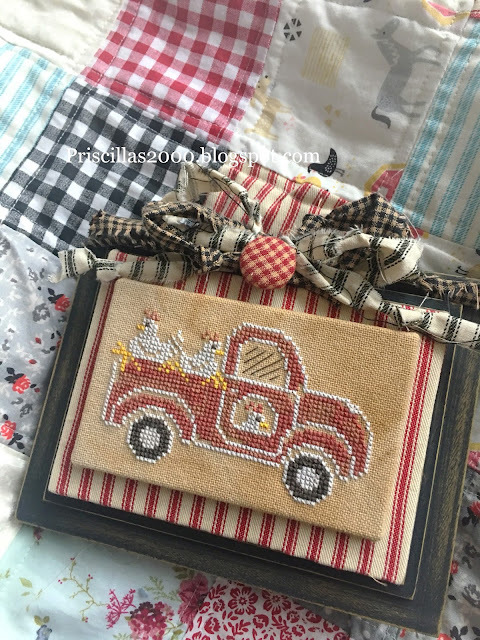 The chalkboard to cross stitch collaboration between Hands On Design and me ! I used a frame from the thrift store.. mounted red ticking on sticky board and then glued that to the top of the frame .. I then mounted the stitching on sticky board and then hot glued that to the ticking..
she used the Classic Colorworks Barn Door , Gentle arts chalk and dmc 844 for the tires.. 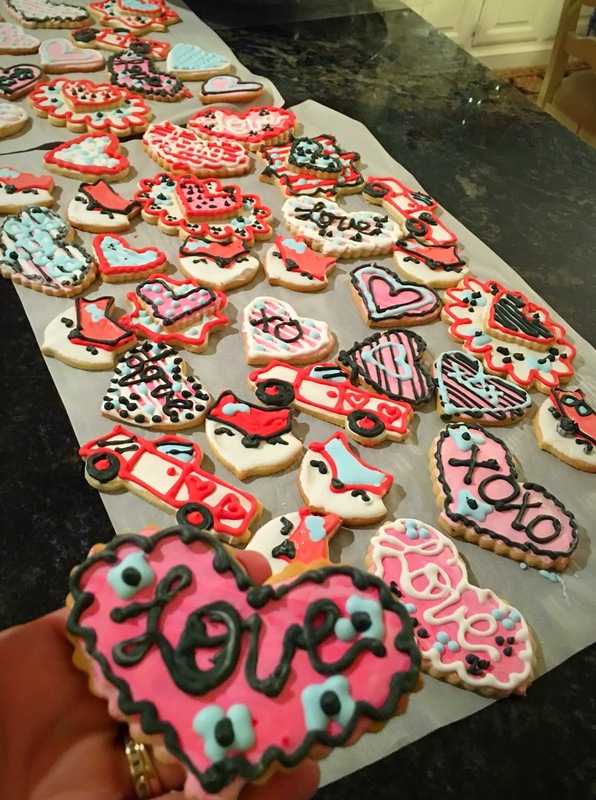 I made valentine sugar cookies for my little valentines..I spent a couple days this week taking down all the winter decor.. spring decor will be going up soon! 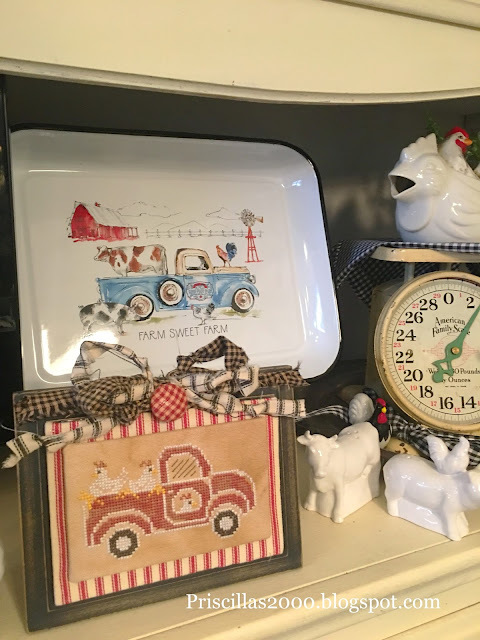 All my farmhouse touches are heading back into the kitchen! I have just discovered you guys - and first of all - you are adorable! And I am now obsessed. 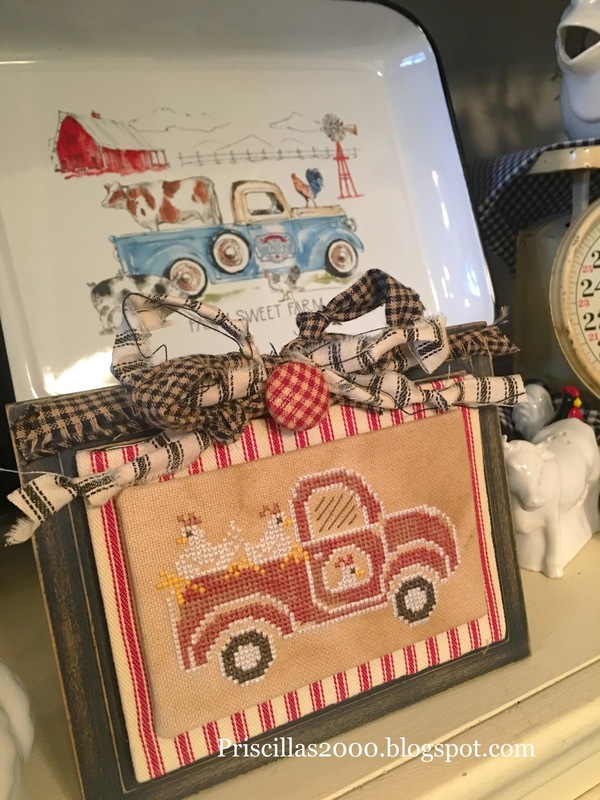 In addition to my quilting, knitting, crocheting, Needlepoint, and weaving - I've decided I have to go back to cross stitch too. I've been putting it on the back burner for years because I didn't think my eyes could deal with it - but everything I have seen on your videos is so cute - I have to do it one way or another. So thanks! And keep up the adorableness!!! I was wondering where the cookies were! I started reading your old blogs, I am up to 2013! You are a woman after my own heart. Love banners, Christmas, fall and Halloween. Love your cookies, I don't bake sugar cookies but might start!!!!! Love Saturdays to see you and Chelsea. Stay crafting!! I have now added you to my list of My Favorite Blogs on my Blog. I just love you and your daughter - the stitching that you two do just amazes me. Both of you are my Inspiration. 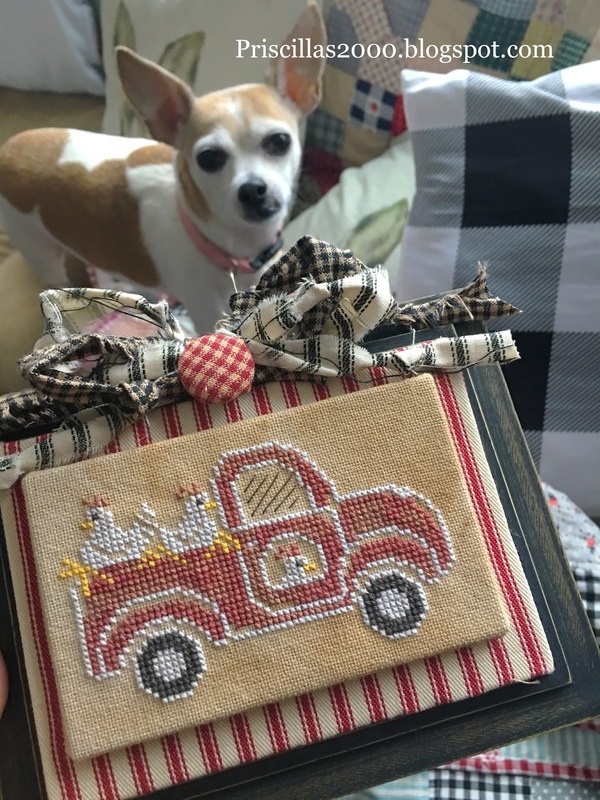 I love your Quilting too. You do beautiful Quilting. 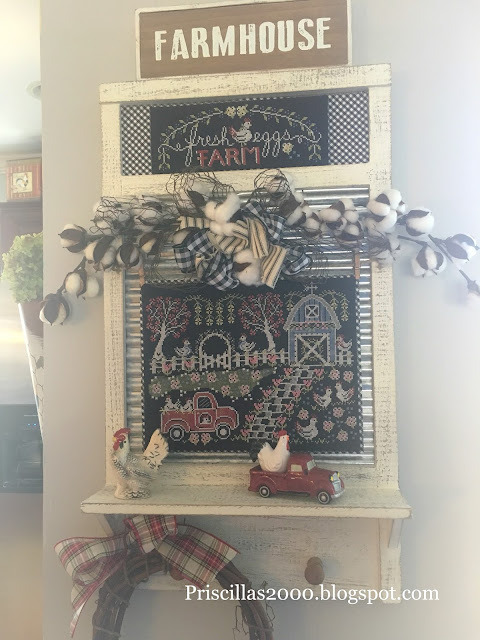 I want to stitch Fresh Eggs Farm Pattern so I will be ordering that pattern from Down Sunshine Lane. I hope that you will follow me as well. Chelsea, love your truck. Just such a great idea to take a small piece out of a bigger one to make a lovely treasure. Happy stitching. Looks darling. You both are so talented! I have been reading your blog and watching you and Chelsea on flosstube for awhile. I think you two are just the cutest! I would love for you to check out my blog. Beautiful finishing so inspiring as always. I have just got my copy of chalk on the farm cannot wait to start it just need to decide on fabric. Can I ask how you rip your homespun/ticking fabric do you just make a cut and tear down the length ? What a darling take-off from the larger piece! Love everything about it! Gotta try ripping some of my homespun and ticking... I like that look! One thing I noticed that is very cool is the 'Farm Sweet Farm' tray BEHIND the truck finish... I love metal trays, and that one is sweet! Thanks for sharing!